Americans who visit France are often surprised to wake up in the morning and find themselves with a few pieces of baguette or a single croissant for breakfast. Those are in contrast to our breakfasts, which can be groaning-board sized, featuring some (or all) of the following: Eggs, sausages, pancakes, bacon, oatmeal, cereal, toast, orange juice, and waffles. Don’t get me wrong, I love big breakfasts sometimes, but more often than not, I have coffee, juice, and toast with good butter and jam. Tartines are the popular breakfast in France, a word which comes from the verb tartiner—”to spread.” So along with the basket of bread offered, there’ll be lots of butter and generally some sort of confiture (jam or jelly) in a pot alongside. I rarely buy jam since it’s something I like making so much. And with all the great summer fruits available, it’s something I’m happy to do – and make enough for the rest of the year. 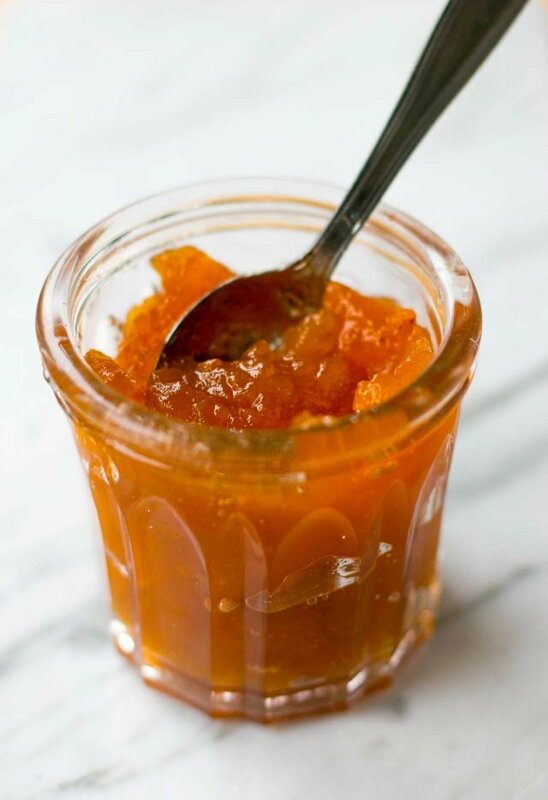 The flavor of jam that gets French people most excited is homemade apricot jam. Thankfully, fresh apricots are plentiful and inexpensive in the summer. 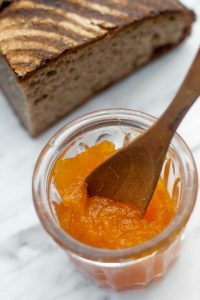 Apricot jam is incredibly easy to make and the tartness provides a fruity tang which is a rather pleasant thing to wake up to in the morning. My other unofficial survey has shown that the French prefer single-flavored jams, rather than mixed with all sorts of ingredients and spices, so I resist adding other fruits or berries to it. Sometimes I do add some vanilla bean paste to my apricot jam, but most of the time, it’s just apricots, sugar, a squirt of lemon juice, and kirsch. I should note that I like my jam on the tart side. The amount of sugar shown is based on how much apricot puree I got from this particular batch of apricots. Because fruit doesn’t grow in standardized quantities (at least the fruit I want to eat) my general rule is to use three-quarters of the amount of sugar per one-part apricot puree. So if you use more, or less, apricots, simply use for each cup of puree, by volume, three-quarters cup of sugar.Apricots become quite tangy once cooked, so you’ll find this is not very sweet. I don’t recommend using less sugar, since it may not jell correctly. 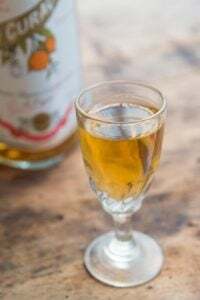 A bit of lemon juice added at the end provides additional balance, and Europeans often crack a few apricot kernels open and add one to each jar before pouring in the jam, which isn’t meant to be eaten, but gives the jam a subtle, bitter almond-like flavor. 1. Cut the apricots in half and extract the pits. If you wish, crack a few open and put a kernel in each jam jar you plan to fill. 2. Place the apricots in a stockpot or Dutch oven, and add the water. 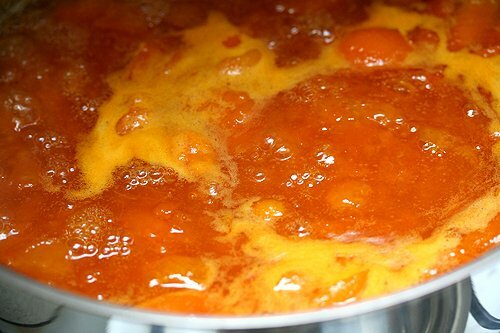 Cover the pot and cook, stirring frequently, until the apricots are tender and cooked through. 3. Put a small plate in the freezer. 4. Add the sugar to the apricots and cook, uncovered, skimming off any foam that rises to the surface. As the mixture thickens and reduces, stir frequently to make sure the jam isn’t burning on the bottom. 5. 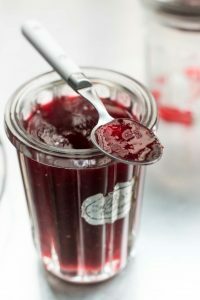 When the jam looks thick and is looks slightly-jelled, turn off the heat and put a small amount of jam on the chilled plate. Put back in the freezer for a few minutes, then do the nudge test: If the jam mounds and wrinkles (as shown in the photo), it’s done. If not, continue to cook, then re-test the jam until it reaches that consistency. 6. Once done, stir in the lemon juice and kirsch, if using, and ladle the jam into clean jars. Cover tightly and let cool to room temperature. Once cool, refrigerate until ready to use. The grass is always greener, isn’t it?! Yes, huevos rancheros and Belgian waffles are delightful. But right now, (just 4:30 am here), the idea of warm, crusty French bread and your beautiful, vibrant apricot jam sounds just like heaven to me. The photo of the bubbling pot, with jam so thick and creamy looking, is very enticing. I can almost taste the tart fruit as I sip my morning coffee. You have inspired me. I think it’s time to put up some preserves. Thank you David. The color is fantastic on that jam. Looks just like my counter when I make jam – lots of different size and shaped jars, fun colored tops. When friends are here for breakfast, I love getting an assortment of fresh breads and then just putting out a half a dozen types of jam for them to try – that’s all you need. (and good Breton butter of course) Then again, pancakes are nice too! And this apricot jam would be great on them as well…. I would think that habits have changed a bit since then? I forgot to add that what intrigued me most about French breakfast habits when I lived in Paris, was these powdered “breakfasts” that you stirred into bowls of hot or cold milk. Does that still exist? I love apricot jam. Yours looks beautiful. Here in New England, fresh apricots are not so easily come by. Have you ever tried freezing your jam (not in jars, obviously)? I am wondering how that would work for preservation. I can’t think of anything against it but wouldn’t like to spoil a batch to find out! The blackberries have been plentiful this summer and they are so sweet I reduced the usual amount of sugar by half for my last batch of jam. Charlotte: I’ve not frozen jam. For one reason, my freezer is pretty crammed full of ice cream (!) and other stuff, plus I’ve simply refrigerated this and have never had a problem with spoilage. If you’re referring to ‘freezer jam’ recipes, the ones I’ve seen are for low-sugar jams, which are meant to be eaten within a few weeks. And I remember living in New England, and the first time I saw a fresh apricot, I was pretty amazed. They’re really plentiful here. 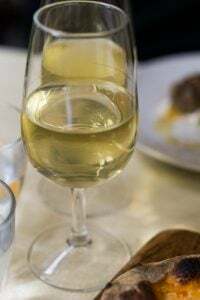 Tone: I have seen the Ricore, the powdered chicory-based drink that some French people have for breakfast. It’s not bad, but I’m a café au lait person in the morning, then I switch to café express for the rest of the day. Christina: Romain flips if I add things to jam, like vanilla, (or even if I mix two fruits, like plum and raspberry) saying that it detracts from the taste of the fruit. I think he’s right to some extent, but if used subtly, a dash of vanilla adds a nice background note. This looks fantastic. Do I need to peel the apricots first? Naturally, the one fruit we hardly ever get here @4200 feet in the Great Basin of Western Nevada…but loads of peaches/apples/pears. Will show this to my sister (who has taken your course in San Antonio/Gucci B) very busy processing fruit/veg (this week peaches) out of our garden, freezing just processed pulp, will have to show her this technique. She receives your emails too but may not have seen this one yet (she was processing plum tomatoes the last time I saw her). Next week corn. They’re buying a new freezer next week to hold a bumper crop of everything. Oh, and yes, the U.S. breakfasts here are great, as written, but rarely get cooked, put me in the bread/butter/jam group…oh, for the baguette of old…sigh. Don’t buy a ticket home just for ephemeral hash browns…you’re on the winning team over there. Vera: I’ve never peeled an apricot. The skins are where the tartness is and apricots should be used when very soft and ripe. You might want to check out my write up: How to Select Summer Fruits. If you did have the patience to peel small apricots, I think you’d end up losing a lot of the fruit. Is there anything prettier than a cupboard full of jars of homemade jam? Ugh, you’ve just reminded me how completely gross we (Americans) can be with our excessive amounts of food consumed first thing in the morning. I think that’s what I like best about France… the reminder that simple can be fabulous. We enjoyed a stay in the French countryside one summer & loved our understated breakfasts. Apricots were all over the place on my grandparent’s ranch when I was growing up. We ate them by the handfuls, and grandma always made loads of apricot jam. Sadly, I never got her recipe, but I do still harbor a fondness for apricot jam. Should I come up w/ a bounty of fresh apricots, I’m all over this project! The colors in this jam are stunning and I appreciate that you don’t overdo it on the sugar. I have always been such a wimp about making jam because I always thought that I would have to go through the whole canning/sealing process to make a jam that would last longer than a couple of weeks. You are telling me that I can make jam, close it in a clean jar, and enjoy it for up to a year? You are my new hero! I grew up eating breakfasts of scrambled eggs, bacon, or pancakes, etc., but as I got older I eat healthier….fruit for breakfast along with a good fiber packed non-sweetened cereal with fat free milk. I try to keep sugar out of my diet because my doctor told me that it impairs my immune system. I have noticed that since I’ve stopped eating sugar and exercise daily that I don’t get sick as much. I love how you reuse jars, just like my mother always did, and just like I do. The jam is gorgeous too. American breakfasts can definitely go way past decadent to crazy coranary destruction. However, I have never come accross a more unappealing artery clogging nap inducing breakfast than the traditional FULL English breakkie or fry up. It includes all or most of the following…fried eggs/ fried pork sausage /bacon rashers/ blood sauage/ baked beans/ fried tomatoes & mushrooms/ toast with butter and jam… And to wash it down with a pint or two! So if the food doesn’t put you in hospital the beer might run you off the road drunkenly on your way to work. I was a kid when I first saw this meal in a pub in east London. It left a big impression :-). Your shot of the varied jars of your gorgeous apricot jam made me smile, thanks for the memories and the recipe. 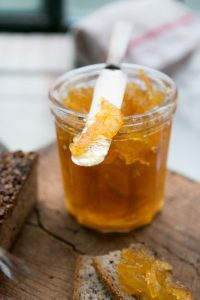 This year when my apricot tree did it’s thing I had been having a romance with orange marmalade and still had a couple of oranges left in the box, so I chopped an orange or two up (no seeds but peel and all) and made an orange-marmalade combo that is….delicious. My jams are always seat-of-the pants affairs….not very sweet, no flavorings except sugar and maybe lemon, never any pectin, just cooked until I’m bored and they are always delicious. Your apricot jam looks lovely. I nearly made it the other week, but was put off by the thought of cracking the stones for the kernels, which I was taught always to put in it, so I’m glad it’s actually optional. My mother and I make lots of raspberry jam, and I bought some cheap strawberries and made strawberry jam, too, this summer. 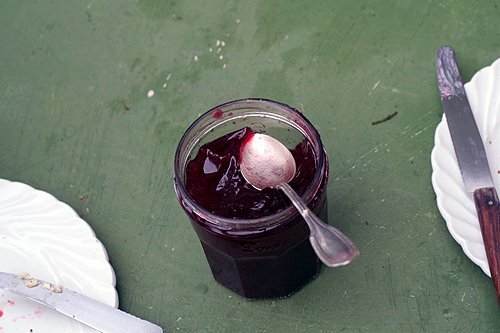 I believe the secret of jam is not to make too much at once – no more than 1kg fruit, and maybe even half of that. What you can do – well, not you, as your freezer is full of ice-cream, but “you” in a generic sense – is freeze the fruit and make jam from it periodically throughout the year, or buy frozen fruit (raspberries, especially) and make jam as and when. It is plum season now here in England, and I may well make a couple of jars of plum jam if I find some cheap ones. Apricot jam is my personal all-time favorite. I had never thought about putting one of the kernels in each jar. I’m definitely going to have to try that! I have never been to France, but once I was in Ireland and stayed at a Bed and Breakfast and the breakfast they served me was very tiny plain scones with different flavors of jam. It was heaven. The breakfast may have included other things too, but all I remember about it were the scones and the coffee. Sometimes I amazed when I go out to breakfast here (in Oklahoma) and I order something that sounds like it will be simple like a “granola sundae” and they bring out 3 plates of food just for me. Breakfast places here also like to do that, give you a different plate for each item. One plate for the toast, a little plate for your eggs, a plate to put your jam on, a plate for your “main course”. I guess we don’t like our food to touch around here. It sure is an awful lot though. MMM, apricots. They’re a little tough to find here in Ohio. My grandma always had apricot jam around so I always think of her when I see it. I love the collection of saved jars by the way. Quite lovely. Right now elderberries are in season here, I just picked a bunch and my task today is elderberry syrup – mmm. As much as I used to love the croissant, butter, and high quality jam breakfasts in Paris, with café au lait, of course, I can no longer warm up to the idea any longer. That sort of breakfast sets me up with sky-high blood sugar levels, followed by deep low blood sugar reaction (and a roller coaster temperament to go with it), and hungry for the entire day. Unlike the fat-phobic folks who think grains, low-fat adulterated milk, and concentrated sugars (fruit preserves) are the most healthy (they’re not, not really), a not-quite-full British fry-up with eggs and high quality bacon and/or sausage will keep me going at full steam until well into the afternoon with stable, even, and extremely happy blood sugars. And it tastes nice and savory to boot, which seems more satisfying in the morning than a lot of sugar. I skip the toast or muffins as well as any low quality bangers that seem to have more starch filler than meat. I describe this as feeding the fire within slowly with hot coals instead of a continual feed of kindling. 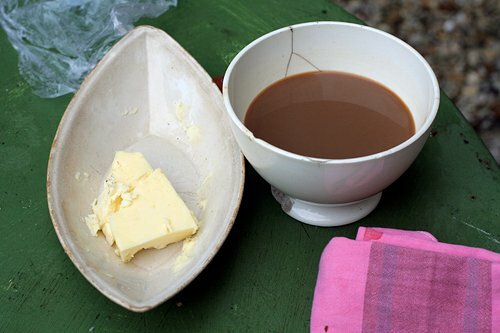 At home in California, my usual breakfast is two “backyard” eggs lightly cooked in generous amounts of grass-fed butter and an Americano espresso coffee. If I tire of my “usual”, then I scramble the eggs and make a cheese and avocado omelet, topped with homemade crème fraîche (or have cottage cheese topped with chopped fresh fruit, but always ample natural fat and adequate protein to fuel my day). With food-of-the-gods like this that also nourishes my body well, there isn’t much need to pine for the lost pleasure of bread & jam. I’m thinking about planting an apricot tree in the garden, as they do well in my So Cal location. Fresh, properly ripened apricots are divine and something to treasure when in season (I rarely buy the greenish tinged apricots I see even in the California stores). But I’ll probably enjoy the fruit fresh out of hand, cooked with meats like pork or chicken, or in GF clafoutis or cobblers. Of course, I can also share the short apricot season with friends and family instead of preserving it. I love Apricot Jam! I make a smoked duck, Gruyere and apricot jam quesadilla that is just delicious! Now I want some! I had a superb collection of jam jars similar to yours…and my once-a-week cleaner threw them all away last year. I am still sad. The apricot jam looks delicious. It’s very hard for me to find apricots, but I made a peach a cherry jam not too long ago. i poured some hot water over the peaches and pitted cherries ans scraped in a bean of vanilla and plonked that in as well. This sat overnight and omg, you won’t believe how wonderful this overnight infusing was! I made a super fragrant jam and I can’t wait to try this method again. Apricot jam has been a favorite of mine since I helped my mom pick the apricots and make the jam as a kid. The color of your jam is a sure indication of how yummy it is. When I was last in Paris we ate breakfast at a place where all they served was an amazing variety of breads and on the table was a great spread of toppings that could be applied. I loved the simplicity and hearty breakfast complete with a lovely cafe au lait to start the day. This jam would certainly fit the bill. I do love simple breakfasts of bread, butter, and jam, but I also love the big breakfasts that leave you so satisfied that your tastebuds need nothing else for the rest of the day. Huevos rancheros, bacon and eggs, sausage…mmmm. The jam looks perfect! I love it’s simplicity; it highlights the beautiful apricots in season. there was an apricot crumb cake made on butter shortbread that I had at a farmers’ market a while back, and that taste of the apricot has me jonzing for it and the recipe. I love a good apricot jam and this would be perfect for a tart too. Just something small, “2. Place the jam in a very large stockpot”…Place the APRICOTS. These particular photos are fantastic. This looks amazing! David, I have a tree full of Damson plums in my backyard, and want to make jam with them. Do you think the 1 part fruit to 3/4 part sugar would work with them as well? I’ve looked for Damson plum jam recipes, and the fruit to sugar ratios vary wildly. Like you, I prefer my jam on the tart side as well. Are the pits safe to include in the jam? I was under the impression that they contain cyanide. Kirsch – what a great idea. I just made a pile of apricot jam (and am getting ready to make some more from the last of the apricots). Used some for rugelach and kolachy filling. Cannot express how darn good they were! I am lucky enough to have two large apricot trees. If a late frost doesn’t turn the growing fruit to black olive look-alikes, I make dozens of jars of apricot jam. Those jars are like currency. I’ve paid for carpenters in jam. Friends become even friendlier when jam is available. When I need volunteers to help me with work at the local fall fair, I lure them successfully with apricot jam. It’s powerful stuff! I think this post is illegal. Well heck, I’m danged sure about it!. Posting about fresh apricots and homemade jam is dangerous in the eyes of a starving, dieting, can’t-drop-a-few pounds, old and haggered woman. Have mercy. Can’t you write about concrete, bits of steel, road kill or fungus on a dying tomato plant? Pronto, el Pronto. Snap! Snap! You! You got me started on the Kirsch thing. I’ve made some sour cherry pies while the cherries were in season and I soaked the pits in the kirsch to help get the cherry juices that cling to them back into the pie and, hopefully, to glean off some of that natural almond flavor from the stones. I think it works! I’m going to try this trick next ‘cot season with those stones too. Much to my mother’s chagrin, the only thing I would bring for lunch during my entire school career was a peanut butter and apricot jam sandwich. It’s still my favorite. Maybe if we’d had the quantity of fresh apricots seen here, she would have understood! what about apricot jam and vanilla ice cream? Or with a vanilla parfait? 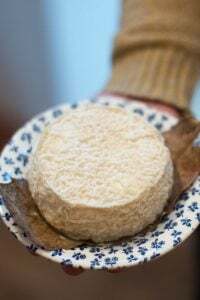 Or with your favourite soft cheese? definitely one of my favourites..
also one of the best flavoured ice-creams i’ve had as well..
haha¬¬ last time i was in Paris and was eating these French breakfasts every morning….with my love of butter, jams, spreads and all things pastry.. i put on 5 kg in 2 weeks…. Kimberley: Yes, this recipe should work fine. 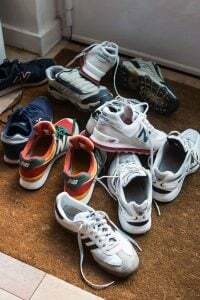 Shannan: If you wish to leave them out, you can. Europeans use them all the time in jam and even Trader Joe’s in the states sells bags of sweet apricot kernels, for eating. Although I’ve been canning for a few years now, I made apricot jam for the first time this year. It was hands down the most beautiful thing I’ve ever made. I should have made more because I feel like every bite is so precious. I would just like to mention the very sad fact that the liquor stores in the entire state of Pennsylvania are no longer carrying kirsch. Never let it be said that weird bureaucratic quirks are limited to Paris. Sigh. I love France, I really want to live there some day. I find that when I make meals based on French inspiration, my meals turn out better. Although they may be more simplistic, they have more flavor and depth, which is what really matters. That apricot jam looks amazing!! I’m not usually a huge apricot fan, but the tartness of the that jam sounds really appealing – will definitely try it! I miss those “continental breakfasts!” :) Hope you don’t mind, but I linked to your blog today in a post. You can see it here. Hope it’s not a problem, but if it is, let me know! Thanks!! Hi David! When I was in Paris in July, my sister served apricot jam with gingerbread spices along with baguette for breakfast. Apparently she got it in Northern France. I’m going to use your recipe and ad lib the gingerbread spices based on another recipe. Have you heard of this? have you tried it? Your apricot jam looks stunning! I have never tried making jam before, but this post made me quite nostalgic for the mango jam my mother used to make every summer in India. Hi David, great post once again. I live in Melbourne and I’m a keen jam maker, but I discovered that apricot jam is not popular among many Australians. Some of them actually turned their noses up at it, much to my amazement and consternation, saying apricot was their least favorite jam! Well, more for me I say..
BTW, I know you said you don’t like mixing your fruit, but next time you make orange marmalade, try adding some small chunks of pineapple (perhaps 1:5 pineapple to orange ratio). 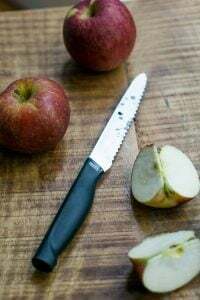 You’ll discover these 2 fruits have a great affinity. 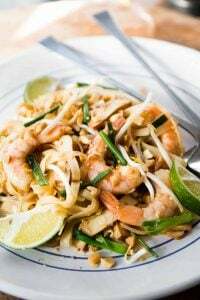 David: This recipe was lovely – thank you! I served it with a simple almond cake that I make for breakfast and with some unsweetened whipped cream. It was a hit! Thanks for always giving me the inspiration to try something new…and for getting rid of the huge pile of apricots that I wasn’t sure what to do with! and reminds me of the only confiture my french grandma would make. what she added to apricot jam (similar recipe to yours, david) was the little almond-looking nut that is located inside the apricot pit. so as a kid, my brother’s job and i was to smash the apricots pits (and that’s quite a lot of them since several dozens are concentrated in a single jar) with a hammer, get the little almond-looking nut and my grandma would add that to the jam. that would add a charming, sweet bitterness to the jam. Thank you THANK YOU for including the target temperature in for those who want to cook this lovely dish, but want to use a candy thermometer. I honor those who can rely on your “frozen dish” test, but I, for one, do not have the confidence to rely on it. For some of us, hard-and-fast rules simply work better. Wow. I love jams and canning. And now the canning season is upon us, we will be sure to try this one. Just last night we made blueberry chutney with açai and garam masala. Goes great with duck. Thanks for this! If the mark of good cooking writing is that it makes the reader want to rush out and make it, you get an A+. I’m sitting here at my desk in Boston trying to figure out how to score some fresh apricots. Thank you for the inspiration! I absolutely LOVE apricots & apricot jams (as well as any cookies, pastries, etc.) made with those ingredients. I’m keeping my fingers crossed that I can get some tomorrow at the Tuesday lunchtime farmer’s mkt at the Ferry Bldg in SF. We are definitely on the outskirts of apricot season in No Cal, and I don’t recall seeing them last week. If not, I’ll have to file this away & try to remember to do it next year …..
hi Tom: I only give them a brief skim, but you don’t need to do it. It does make the jam somewhat more cloudy, but it doesn’t affect the taste. Happy jammin’! Apricot jam is a wonderful thing indeed! I looked at apricots at the store this past weekend and they were $3.99/ pound. Apricot is the one kind of jam I will continue to buy on occasion instead of making myself. There is a Swiss brand that is pretty good and that will have to do since apricots are not plentiful or all that great where I live. Just made the jam today (minus the pit). Kirsch is a wonderful addition. I hadn’t ever considered it with apricots. Charlotte – you can freeze the jam – even in the proper canning glass jar, just be sure not to overfill. I did it last year (same recipe minus kirsch and pit), but same other ratio- and it stood up very well and was very fresh tasting. For those wondering about skins. You need them to make the canning right and the virtually disappear when cooked. Sue: I only make jam during the tail end of apricot season: when they hit €1/kg (about 50 cents/pound), I get out my jam pot. Still, at the price you’re getting them at, for around $10, if you can get 5 or 6 jars out of them, that’s still a decent deal! Shannan: Thanks for the report on freezing. And yes, the skins disappear and are important for the flavor, too. Viennese too seem to love bread and butter and jam for breakfast. The variety of bread offered for breakfast is fabulous. I have made some jam too this week, a kind I had never done (or tasted for that matter): cherry tomato jam. I had way too many from my Mom’s garden and so I thought I’d try, just for fun. I just took cherry tomatoes and some “sucre cristallisé” (coarse sugar?) that I put together (in layers) in a big bowl for some hours, then I added some lemon cut in very thin slices when cooking it. The result is delicious and surprising! It should go well with some cooked turkey or chicken. I have always seen jam being made in my family but we never put it in the fridge (only when the jar has been opened). The trick I learned is first to hold the empty jar upside-down over the just finished jam so that steam covers it inside, then pour jam in, then at once put the lid on, tightening it well. Et voilà! About half an hour to an hour later, one can hear a big “pop” sound from the lid that tells it is secure. It saves very well for months. Here’s another “truc” for jam I learned from my farm wife friend, Danie Dubois, in the Dordogne: fill the jam jars to the very, very top. Slap on the lids and immediately turn over to cool upside down. This creates a natural seal and usually helps avoid the whole refrigeration thing. Thanks for great photos and enticing recipes. 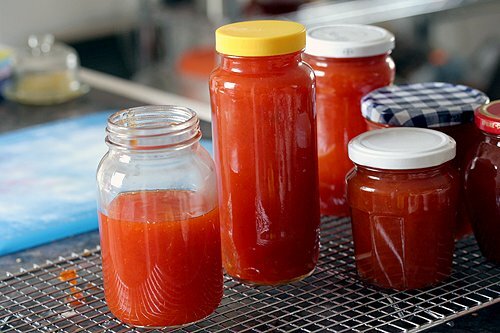 Hi Nancy and Elanor: Thanks for the tips on how to avoid canning. If I had room for the equipment, I’d probably take it on the ‘real’ way, although I know people do have success with the methods you’ve mentioned. My refrigerator is currently bulging with jam jars, and my only solution at this point is to start eating more jam….fast! ahh…I should have read to the last comment. Skimming is not enough. Elanor got there first. I just want to interject that I am like David, fridge is easier than the re-boil canning process. Needless to say I have two restaurant-sized refrigerators…in Japan. Which goes to show the more room you have for storage, the more you have to store. I found my Japanese-style (quick boil) marmalades got moldy even in the fridge. My traditional marmalade and apricot & raspberry jams have done well without refrigeration. I use the 1:1 fruit sugar formula for jam as David does. Though I keep them in the Japanese equivalent of a “cave”—my “kura.” The wine is there as well so I visit it every night. Beautiful. I envy those who live in countries where there is a bounty of things like apricots, peaches, etc. The closest I can come is making loquat jam in February. I am not American, but I do love those American breakfasts, all of the above. And I am deeply ashamed to admit that on my second trip to Paris to visit a boyfriend I took Pepperidge Farm English muffins and peanut butter so I would have something to eat for breakfast. I LOVE quintessential american foods, i.e., grilled hot dogs, hamburgers, sundaes, etc., but breakfast is one of those meals that makes me feel so french. All I want is a piece of bread and some delicious coffee. And this will be the best addition to that plain piece of baguette that meets my tummy first thing in the AM. I’m especially in love with the vanilla bean paste idea! Thanks for sharing. I remember growing up, summers in my granny’s kitchen; her teaching me how to make all sorts of jams and preserves and pickled veggies for winter. Oh, those days, I wish I could go back and enjoy them again! Just one question: do you leave the apricot skin on or peel it off? I was told they turn brown over time and take away from the nice colour of the jam, looking like brown specs in the orangy gelee. great pics and wonderful recipe! Hi David! The color of your apricot jam is a knockout–here in southern California we never got apricots that good in the stores this summer, and I haven’t made friends with the right people for a good backyard fruit supply (yet; my neighbor has a tree full of Reine Claude plums though–I’m angling for a hatful or so). Two last-ditch remarks on the jam vs. eggs issue, since this is way late for your post: 1. Apricot jam makes a breakfast-worthy filling for a sweet omelette and 2. A dusting of cinnamon is practically obligatory if you go this route. this is my first post. i tried the recipe above, but used peaches. 2 lbs. peaches to 6 cups sugar. it just didn’t seem right. should i have used the puree to 3/4 c. sugar formula? or perhaps you meant 2 cups sugar? please let me know, i’have some fruit ready to be made into some fall jam. thank you. Orangegummi: Since you used a difference fruit, making a substitution, I can’t advise. But the recipe does not say 3/4 cup of sugar: it says 3/4’s sugar to 1 part fruit puree. So those are the proportions that I followed. I wanted to share this with you as you are so generous with your recipes. 2kg apricots, halved & covered with 1kg sugar & 400ml lemon juice – leave covered overnight. Cook for the quickest time possible to bring it to set – this retains a really fresh & intense flavour. I find it doesn’t achieve the same set as a standard recipe and it must be refrigerated after opening – but the flavour is intense. Next summer, if I get any apricots from my tree (fingers crossed) I am going to try your recipe too, it sounds beautiful and with only 1/2 cup of sugar sounds similar in its intensity. For orangegummi, I concur with some comments already posted, generally the quantity of sugar should be 1 cup sugar to 1 cup fruit, but the sugar content of the fruit itself can affect the outcome – read Harold McGee for more info. 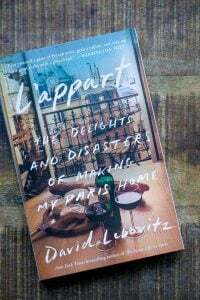 Thanks David, I love your blog, and also your tips about apartments in Paris, I am going to try to rent one of them later this year, and then try your places to manger recommendations! Woops, I meant water not sugar…for the 1/2 cup measure comparison to your recipe, David. Oh my goodness. I stumbled onto this site after seeing our apricot tree loaded with fruit and while wondering what to do with it, looked up Apricot Jam. Beautiful decadent pictures, a gorgeous writing style. Got 20# of Blenheim apricots at the farmer’s market here in California this week and made the jam today. Delicious, thank you! I just made this recipe and it is spectacular!! I am NEVER the person who gets things right on the first try, and it came out beautifully. I did end up putting the hot jam through a food mill because I like my jams smooth; woke up this morning to perfect, delicious French-tasting jam. Reminds me of the summer I lived in Paris during college!! Thanks so much for this recipe, David – keeping it for next time! David, Is it best to use a thick and heavy 8 quart stockpot to make this jam? Or is a thin stainless stockpot ok? Please advise. I plan to use the italian plums season instead of apricots. Thanks. You should always use thick cookware to avoid burning. Joolian: It might be the Australians of English background…. I’m of European background and we all love apricot jam, although not the store bought stuff (ugh!). With regards to sealing a jar, I dont fill to the very top – it doesnt allow a proper seal if its to the very top. Fill so there is still a small gap to the top, put the lid on and turn upside down. You can let it cool that way, or turn it back after a few minutes. The lack of oxygen causes it to seal (and doesnt allow spoilage). I leave my jams in the pantry (along with home made chutneys), and although I used to put them in the refridgerator once open, some of them had the sugar start to crystalise, so they now stay in the pantry after opening. My pantry is quite cool, so no problems of spoilage.